In huge Sanskrit literature, the works published on yoga branch are very little in number. Throughout ancient times yoga has been considered as a strictly secret subject to be tought only to a deserving disciple. But now time has come to uneveil the obscure literature of this occult science to popularize this knowledge in the interest of humanity. (1) Dattatreya Yoga-Shastra, (2) Yoga Bija, (3) Amanaska Yoga, (4) Chandrodaya-Vilasa, (5) Yoga-Ratnakara, (6) Yoga-Tattva (7) Yoga-Chudamani, (8) Yoga Shikha, (9) Yoga Raja, (10) Yoga Kundalini, (11) Jabala-Darshana (12) Shandilya-yoga, (13) Mandala-Brahmana, (14) Amrita Nada-Yoga (15) Dhyana-Bindu (16) Nada-Bindu, (17) Hansa-Yoga, (18) Kshurika-Yoga (19) Amrita-Bindu, (20) Tejo-Bindu, (21) Brahma-Vidya, (22) Saraswati- Rahasya, (23) Saubhagya lakshmi-Yoga (24) Advaya-Taraka, (25) Trishikhi Brahmana, (26) Varaha-Upnishad, (27) Darshana-Upanishad, and (28) Muktika-Upanishad. All of them are treated as secred in the tradition, so some of these works were counted in Upanishad. We find references of twentyone of the above-mentioned work in Muktika-Upnishad by name. The first two out of them had been published by us in previous years. We are deeply indebted to our readers who have shown were keen interest in our publications. 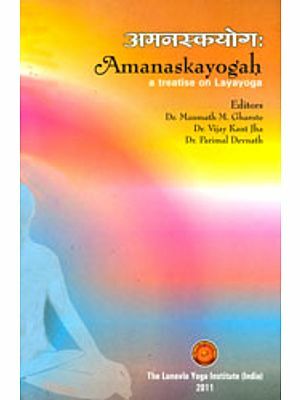 We hope that this work Amanaska Yoga alongwith Hindi English translations, will be greeted with same enthusiasm, some other text on Yoga with Hindi and English translation and some original works on Raja-yoga and Yoga Therapy are ready and will be brought out soon. We are very grateful to Shri Bajrang Singh, who accepted our request and translated this work into English. We hope it will be very useful to them who want to get the straight way for Yoga-Sadhana to reach the goal of their life.